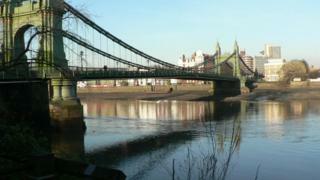 Plans to strengthen a Victorian bridge spanning the Thames in West London have been delayed amid a £5.3m shortfall. Hammersmith and Fulham Council said it had cut council tax by 1% and postponed the £27m works until late 2017. The Labour council said people were its first priority and there were currently no structural issues with the bridge as long as only one bus crossed at a time. Transport for London (TfL) is believed to be contributing £20m towards the cost of repairs, but said it would not comment while negotiations were ongoing. The council threatened to close the bridge in September when it learned Transport for London had removed the bridge monitor who enforced the single bus weight restriction. Its ultimatum came after three buses were seen on the bridge at once, and the authority gave TfL 24 hours to ensure compliance with the one-bus rule, which it did. Strengthening work was planned for the summer of 2016 to help ease traffic flow. Council leader Stephen Cowan said the council had experienced a 66% reduction in its budgets since 2010, but was not prepared to increase council tax by 3.75% as recommended by the government to help the council raise revenues. Mr Cowan added: "There's no way that this council is going to spend anything like that money, the majority of this issue is the responsibility of TfL and we will work with them to make sure the bridge is fit for public purpose."